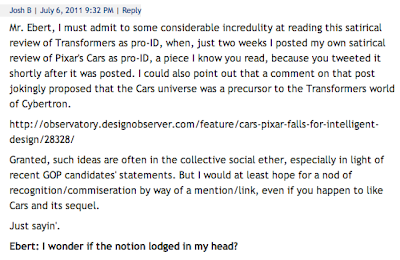 Some of you may have seen that I had a review of the Pixar movie Cars up on Design Observer a few weeks back. Despite the many comments by folks who didn’t get it, the piece was intended as satire, and posited that Cars is propaganda for the neo-Creationist dogma known as Intelligent Design. The day after it was posted, the movie critic and active blogger/tweeter, Roger Ebert, tweeted a link to that review. Needless to say, I was pretty excited about that. Then, last week, while enjoying a trip upstate to visit some family, I got an email pointing me toward something I couldn’t believe. On July 4th, Roger Ebert posted a satirical review of director Michael Bay’s Transformers franchise. 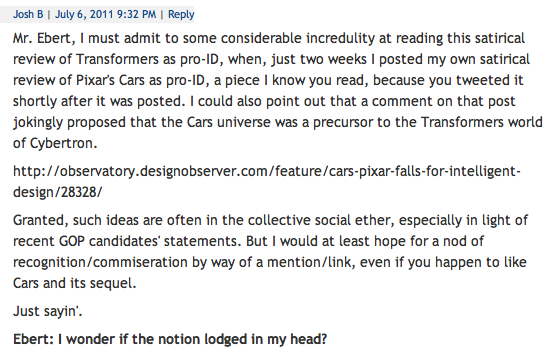 In that review, he put forth the argument that the Transformers movies are Intelligent Design propaganda. Needless to say, I was less than excited about that. Lodged in your head? Yeah, no sh*t.
As if tweeting my blog almost two weeks prior somehow excuses his “use” of it. I won’t ever get the acknowledgement I’m hoping for, obviously. Ebert has no reason to admit any wrongdoing. His is the prevailing blog, and therefore immune to any substantial outrage or public outcry. So, in a odd twist of fate, all I can do is this: teach the controversy. Thank you to Philippe Theophanidis, who tipped me off, and wrote a very generous blog post about it, in my favor. I'd read your review when it was posted and found it an entertaining read. It's a shame a lot of commenters didn't seem to get it. I've also just read Mr Ebert's and the relevant comments. It's a shame he does such a p*ss poor job of acknowledging your work and feels he has explained himself to the second comment referring to your piece. Though you won't get want you want rest assured that your work was far superior that Robert's in every way. A literal post in keeping with Pr*tty Sh*tty too. "It's a shame a lot of commenters didn't seem to get it." Either the commenters are all f*cking dullards or the author is a pr*tty sh*tty writer. Take your pick. "I promptly picked my jaw up from the floor and posted a comment on Ebert’s piece, which went into his editorial filter to await approval." Um...you know that Roger Ebert has had surgery to remove a large part of his jaw due to cancer, right? Grace, you seem to have missed the stinging, poignant satire in which the author is engaging. Careful, you don't want the hipsters to think you're a dullard. I'll go for the former. Thanks. Were you in that group? Not as eloquent as some comments you might get, but still the truth. You win some you lose some. If you have great ideas, expect them to be "aped", ripped off, and just generally pulled from the ether. Your only hope is to move on from this and become the bigger primate.